Follow Here - Download your FREE copy! On this website you will find some of the most beautiful and unique ancient gold & silver coins ever handled. Most of these ancient coins are thousands of years old and while crudely produced feature some of the most intricate and stunning designs ever seen on coinage. Furthermore, each ancient coin has been graded and certified by NGC, the leading grading service of certified ancient coinage in the world today. 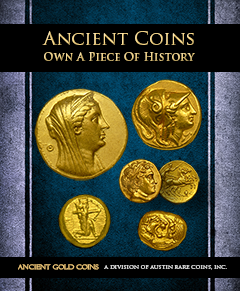 Be sure to also check out Ancient Gold Coins Facebook Page & Why You Should Own Ancient Coins.